I have to say that Nathan really picked the right person to mail Flat Stanley to! 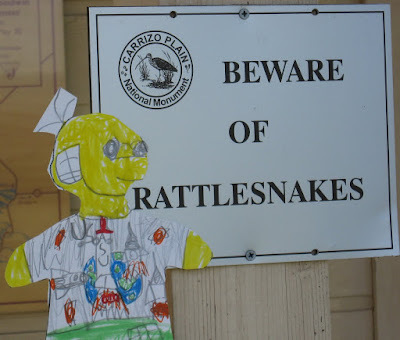 While Stanley was a guest with my Mom and Dad, he got to visit the chickens and collect eggs, go out to Painted Rock and Soda Lake (and watch out for rattlesnakes! 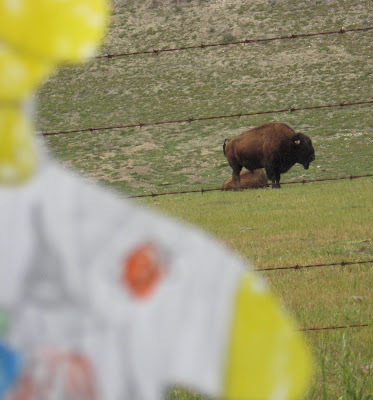 ), hang out with some hot air balloons that landed in front of my parent's property, visit some wild buffalo, mow the lawn with Grandpa, and visit my Dad's work buddies on the set of CSI: New York (which films here in Los Angeles). 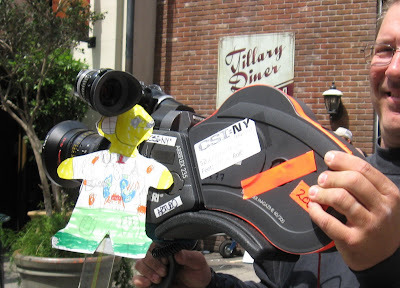 While on the set, Flat Stanley got to handle the film clapper, hold the camera that filmed a scene with Gary Sinise and Hill Harper, and hang out in one of the NYPD police cars with some extras. Stanley sure gets around to all the coolest places! The photos below will be displayed at Back to School Night next week. This is Soda Lake, an alkali lake near my parent's house. When we go out there I imagine we could be on the moon with all the white powdery salt everywhere! 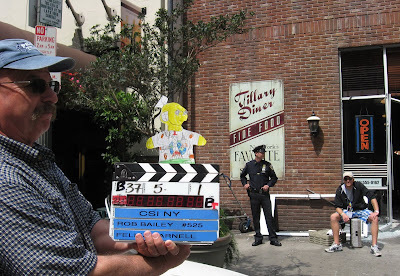 Lucky Stanley got to hang out on the set of CSI:NY. 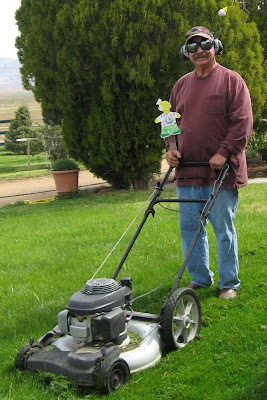 Here he is with the film clapper. That is an extra in the background, dressed up in an NYPD uniform. Maybe Stanley will grow up to be a director? Here he is, handling the camera with the help of the camera man. 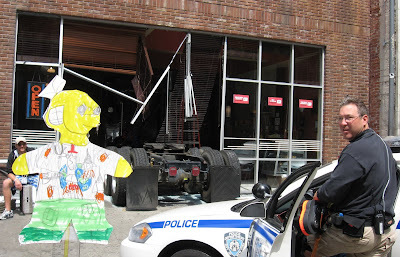 In the scene they were filming, a semi-truck drove through the front of a deli. Look for it in an upcoming episode! 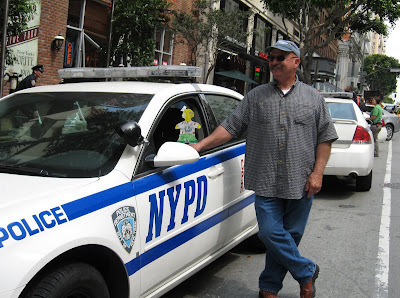 Flat Stanley and my Dad, hanging out in one of the NYPD cars in Downtown LA, which doubles for New York in CSI:NY. 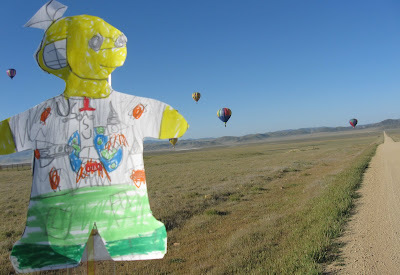 I think Flat Stanley had more fun over spring break than we did!! I find it hilarious that CSI:NY is filmed in LA. LA looks nothing like NY! How do they explain the palm trees? Now I have to watch an episode. 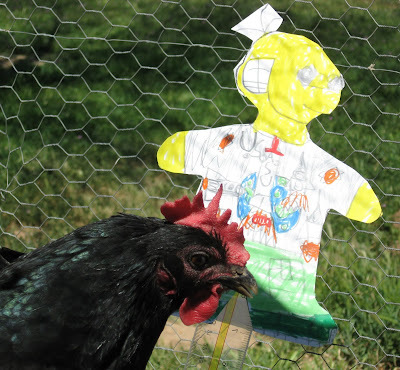 I want to be flat stanley and go to your parent's house. I'm jealous of Flat Stanley.